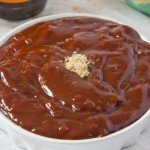 “This is the best barbecue sauce, and trust me I have experimented with hundreds of different combinations over the years, this is even better than any of the popular bottled sauces!" 3 tsp fresh ground black pepper do not use the fine black pepper! 1 tsp unsweetened cocoa powder you'll love this! Add in all remaining ingredients except the marionberries; bring to a boil stirring with a wooden spoon to combine. Midway through cooking add marionberries and 3 cups of bbq sauce to a blender and blend on high for 60 seconds. Add this to the sauce and continue cooking. Click here to learn about the health benefits and handling of chili peppers! We are starting to think about a new sauce that appeals to the heat freaks. Something SUPER hot… I want it to include some super foods so that the health benefits will be just as high as the heat level. I’m really pumped to be donating 10% of all sales to Robinson Cares, where so far to date has donated millions of dollars to various charities!